190604727 -Over six previous editions, Twelve Theories of Human Nature has been a remarkably popular introduction to some of the most influential developments in Western and Eastern thought. 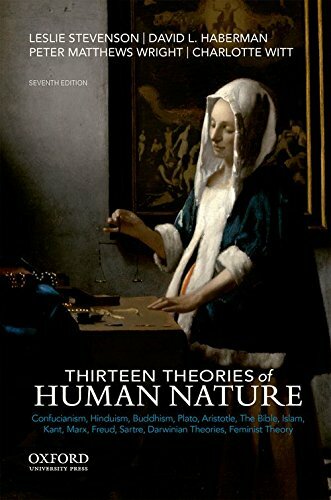 Now titled Thirteen Theories of Human Nature, the seventh edition adds a chapter on feminist theory to those on Confucianism, Hinduism, Buddhism, Plato, Aristotle, the Bible, Islam, Kant, Marx, Freud, Sartre, and Darwinism. The authors juxtapose the ideas of these and other thinkers and traditions in a way that helps students understand how humanity has struggled to comprehend its nature. To encourage students to think critically for themselves and to underscore the similarities and differences between the many theories, the book examines each one on four points–the nature of the universe, the nature of humanity, the diagnosis of the ills of humanity, and the proposed cure for these problems. Ideal for introductory courses in human nature, introduction to philosophy, and intellectual history, this unique volume will engage and motivate students and other readers to consider how we can understand and improve both ourselves and human society.